Day 320 – November 18 FOO FIGHTERS! Why might I drive over an hour on a week night in the rain into the city? Why might I only get 4 1/2 hours of sleep during a week that is JAM packed with work and out of town customers visiting? Some might claim insanity, but I simply proclaim my love of live music, once again. 🙂 Ah yes… tickets went on sale months ago for the Foo Fighters, one of my all time favorite bands. It was their last US show of this tour and tickets sold out in record time for them. I was fortunate to get tickets and it was an absolutely amazing show. I’ve been to my fair share of rock concerts and I can honestly say that this was one the best yet. 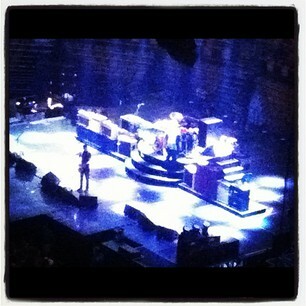 Way to go Foo Fighters!!! Here’s a shot I took with my phone (couldn’t bring cameras in) of the stage just before they came out. I took a few of the band, but with all the lights I don’t think they came out as well as this one where you can actually see the stage. Rock on! This entry was posted in Photography and tagged 365, band, Foo Fighters, music, photography, stage. Bookmark the permalink.